The new Kia Ceed Sportswagon has made its world debut at the 2018 Geneva International Motor Show. Designed, developed, engineered and built in Europe, this third-generation model is the most practical, spacious and versatile Ceed Sportswagon to date – with more cabin and cargo space than its predecessor. The new Kia Ceed Sportswagon is the second member of the new Ceed family to be unveiled in Geneva. Following its reveal in February, the Ceed five-door hatchback also makes its public debut today. 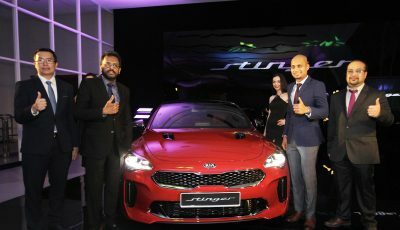 The expanding Ceed range strengthens Kia’s presence in the European C-segment, offering buyers innovative new technologies, a mature and athletic new design, and a more engaging drive. A C-segment tourer designed to meet the needs of European motorists exclusively, more than 512,000 Ceed Sportswagon models have been built at Kia’s Slovakia manufacturing facility since its introduction in 2007. Historically, Sportswagon models have accounted for around 40% of all Ceed sales – compared to around 30% for other C-segment vehicles with tourer variants. 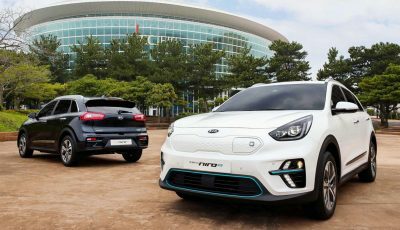 Like its predecessors, the new model has been designed, developed and engineered in Frankfurt by Kia’s European design, product development and R&D teams. It will continue to be manufactured in ilina, Slovakia, on the same production line as the new Ceed five-door hatchback, and the Kia Sportage and Kia Venga. A new naming format – cee’d becomes Ceed – consolidates the new model’s reputation as a car for the Community of Europe, with European Design. 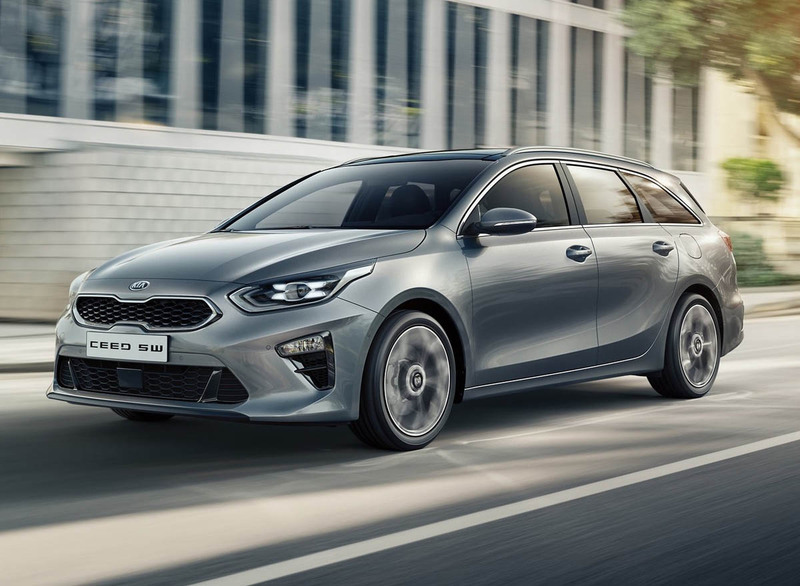 The new Kia Ceed Sportswagon has been designed at the brand’s European design centre in Frankfurt, Germany, under the direction of Gregory Guillaume, European Head of Design, and Peter Schreyer, President of Design and Chief Design Officer. The new model’s body echoes the sporty design character of the Stinger, bringing design flair to the compact tourer class with emotive and precise details to its confident tourer silhouette. Lower, wider, and with a longer rear overhang than the car it replaces, the new Kia Ceed Sportswagon is characterised by a cab-rearward silhouette, creating a mature athleticism in its overall design. Like its five-door hatchback counterpart, straight lines replace the rounded-off edges of its predecessor, and the front features a wider ‘tiger-nose’ grille and lower air intake, framed by precise, linear shapes. The new model features ‘ice cube’ LED daytime running lights as standard, echoing those from the outgoing Sportswagon GT-Line. In profile, the sharp, straight lines visually lengthen the bonnet and give the car a more upright stance. A greater sense of maturity and strength is created in its shoulder line, which now runs along a more horizontal plane, while its D-pillar is shaped to give the upper window-line a sleek new ‘half-moon’ shape. At the rear, new LED daytime running lights give the Ceed greater visibility and on-road recognition. Paired with the bodywork’s straight lines and a subtle rear tailgate spoiler, the Ceed Sportswagon presents a more stable, sporty overall appearance. From launch, the new Ceed Sportswagon will be available in a choice of 11 paint finishes. A selection of wheels and designs are available, with buyers able to choose from 15-inch steel wheels, 16-inch steel or aluminium alloy wheels, and 17-inch two-tone diamond cut aluminium alloy wheels. Inside the cabin, the Ceed Sportswagon is more ergonomic than ever, and with higher-quality materials used throughout. The cabin architecture from the most recent Kia vehicles has been adapted for the new Ceed family, with the dashboard laid out horizontally for a more sculptural, seamless and slimline appearance. This design also creates greater space and a sense of openness for the front passenger, allowing more space in the footwell and a clearer view ahead. The Ceed Sportswagon is also available with a panoramic sunroof, flooding the cabin in light during the day and giving passengers a clear view of the night sky after sundown. 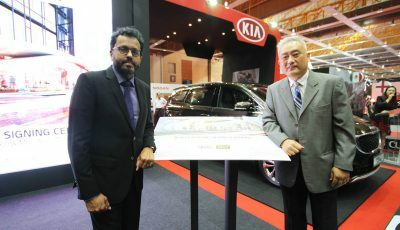 Constructed on Kia’s new ‘K2’ platform, the Ceed Sportswagon is 20mm wider (1,800mm) and 20 mm lower (1,465mm) than the outgoing model. Its wheelbase remains the same at 2,650mm, with the front overhang shortened by 20mm (to 880mm). However, the rear overhang is extended by 115mm (now 1,070mm) – making the new Sportswagon 95mm longer (now 4,600mm) than its predecessor to create significantly more cargo space. Its wider dimensions and cab-rearward silhouette create a more assertive and sporty stance, for a more confident presence on the road. The new platform supports the Ceed Sportswagon’s more efficient packaging, with a more spacious cabin than before. The wider body creates greater shoulder room for rear passengers while a 15mm-lower seating position in the rear creates more knee and leg room for passengers in the second row. Despite the lower roofline, the platform and lowered front seating position ensure 987mm of front-row headroom, similar to its predecessor. The lower rear bench also ensures similar levels of headroom for rear passengers. The new Ceed Sportswagon also boasts significantly higher cargo capacity than ever before. 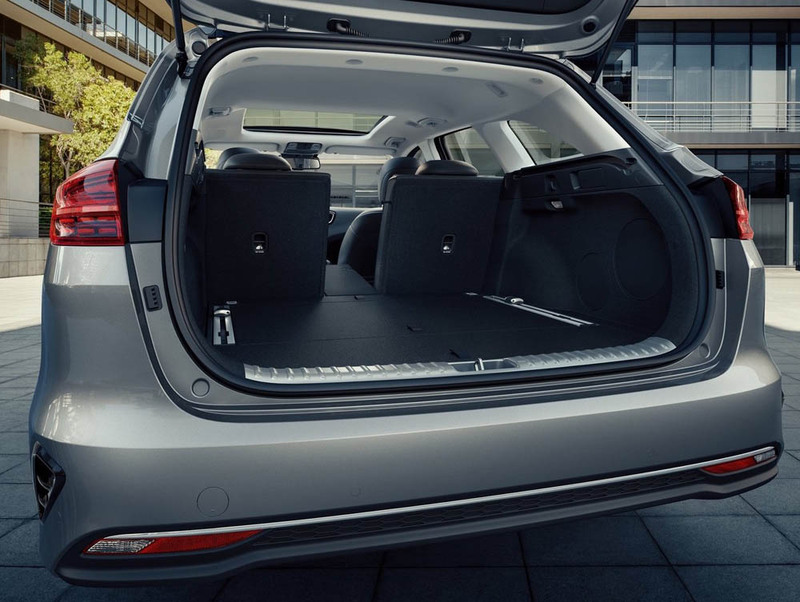 The boot is 72 litres (14%) larger than the outgoing model, expanding to 600 litres in capacity – larger than most D-segment tourers. The boot lip is also substantially lower – the lower lift-over height compared to the outgoing Ceed makes it easier to load heavier items into the boot. C-segment tourer customers’ expectations go beyond cargo capacity, however – versatility and usability are key strengths for the Ceed Sportswagon, making it one of the most practical cars in its class. The split-fold rear seats are fitted in a 40:20:40 configuration and can be folded remotely with a single touch from a lever just inside the tailgate. With the seats folded, the boot floor is completely flat. Every Ceed Sportswagon features an underfloor box to secure or hide smaller items, as well as a tonneau cover and a bag hook to prevent groceries and other items rolling around the load bay. Outside the car, integrated roof rails are also fitted as standard. Customers can also specify a Smart Power Tailgate, which opens automatically when it detects the Ceed’s smart key in close proximity to the tailgate, for occasions when users’ hands are full with heavy cargo. A safety barrier net – between the cabin and the boot – is also available, as well as a net to secure small items, and a luggage floor rail system. 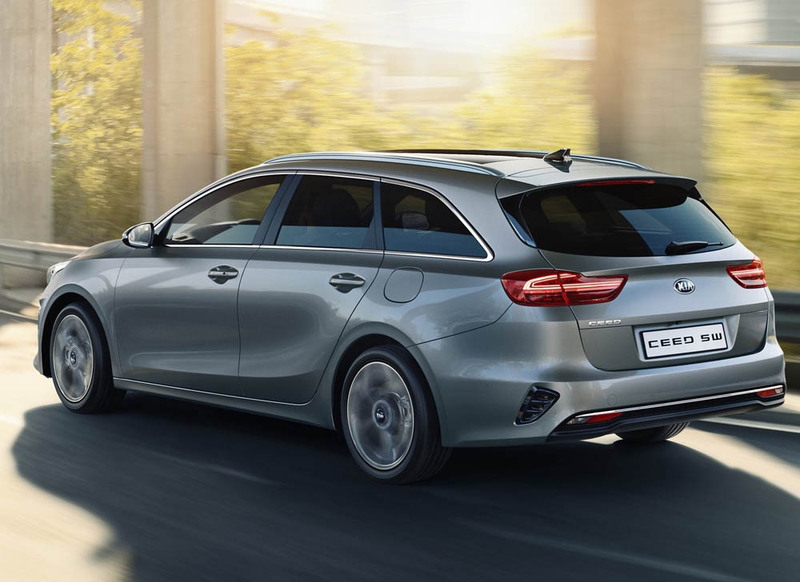 The new Kia Ceed Sportswagon has been engineered exclusively for European roads, with European buyers in mind. The ride and handling characteristics of the new model have been tuned to elevate the Ceed over its predecessor in terms of dynamism and driver engagement. The new fully-independent suspension system will provide drivers with more agile and immediate handling responses, complemented by revised spring and damper rates and a faster steering rack. The ride has been developed on Europe’s wide variety of road surfaces, remaining comfortable while giving drivers the confidence of tighter body control under cornering and stability at higher speeds. The Sportswagon’s rear suspension has been subtly tuned to accommodate the longer rear overhang of the boot, and the potential for larger, heavier luggage loads than the five-door hatchback.